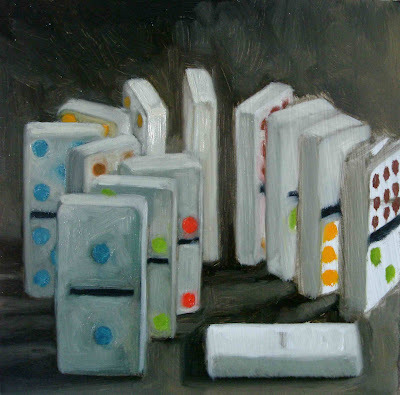 I love to push the first domino and watch the series of each hitting the next and falling down. It's pretty predictable seeing how they are set up but not always. Sometimes we stack things up nice and close in our lives and wonder when one thing is whacked why everything else seems to fall as a result. Sometimes you can grab a domino out of the line further down the series and it stops the falling process. This week's theme is Cause & Effect. 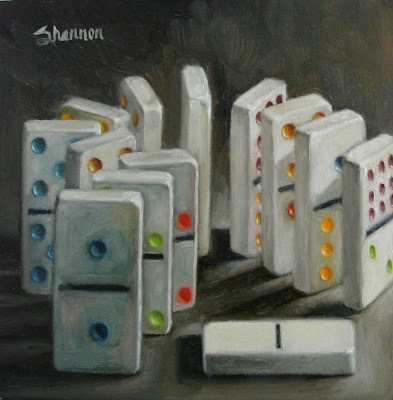 The 1 domino represents a couple and each successive domino things they choose in their lives. The last domino off to the right represents over time a growing family. It happens to show the 2 for my husband and I and the 9 for the 8 children we have and 1 son-in-law. The domino laying down shows inaction, inability and no risk. It's safe. It won't have the chance or opportunity to be knocked down. It also is blank to show emptiness, lack of growth, immoveable on the one hand and calm, stability, and rest on the other. The curvy pattern for the twists and turns in life. 3/30/09 I didn't want you to think that I dropped off the end of the earth so I am posting Mini-Monday even though I haven't finished it yet. It's about half way done. I have a couple of things to do tonight, like pick up my Mom from the airport, and I didn't know when I'd be able to post later. This week's painting inspired by having to shop for a car after the car accident. Great painting. Like a lot of good work, the more you look at it the more you can take from it. I hope that no one was injured in the car accident. Take care and we'll see you in the blogosphere.